The American flag is possibly the most timeless decoration to adorn every U.S. home or business, but, you may not have thought about using it in new, creative ways to spruce up your space in a patriotic manner. If you have a large planter in or outdoors, arrange a handful of large or small stick flags, depending on planter size, in the planter. You can place the planter indoors or outdoors, sprucing up any space quickly with patriotic pride. Consider getting creative with your planter, such as using a large vase with pebbles or sand to create a display that’s as mesmerizing indoors as it is outdoors. Nothing looks more regal than an American flag hanging off a balcony, banister, or railing outside of a home or business. Don’t overlook this creative, yet vintage look on the old classic. More than one flag can be hung if you have more than one balcony, and consider using even three or four flags in the front of your home or establishment for a memorable display. This may sound crazy, but there are interior homes and even an outdoor living spaces, lined with a large flag curtain. No other window dressing could bring more meaning to a space. Adding an additional piece of fabric with fabric loops will achieve this look both indoors and outdoors. 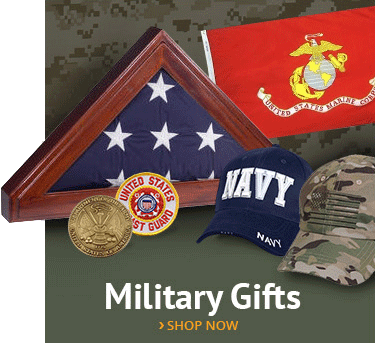 Try framing a flag in its full display to give an impressive and decorative feel to any room. Antique frames and barn wood frames add an additional level of vintage to the look. Frame a flag with the union blue stars to the upper left, whether it is placed vertically or horizontally, and check the other flag etiquette guidelines listed below. Most consider what they can do with their one American flag to decorate, but don’t forget that a number of American flags can create a professional, patriotic display in your home or business. Look online for creative ideas on how to place the number of flags which you own, or to design your ideal front flag display. Don’t worry about overdoing it. There is no such thing as “too much” American flag in America! A flag-lined walk is a classic look, and there’s nothing more special than walking up a pathway or down a sidewalk lined with American flags. This look can be achieved by grabbing a large number of stick flags and placing them strategically down your pathway or sidewalk. Don’t forget your garden and landscaping, or even incorporating stick flags into your children’s play areas. You can also include the flag colors in your landscaping plans—a sea of red, white, and blue petals look lovely next to the flags which inspired them. Show your pride in your indoor space by placing a handful of small flags in a flower vase. You could also fill a wide vase with pebbles or sand and place the small flags inside on a table, mantle, or other visible areas in your home. This would be beautiful for an Independence Day decoration or any other day of the year. Your fencing may seem a bit drab, but adding a patriotic touch will both uplift the area and also show your pride from another angle of your property. Look over your fencing around your property and consider where a flag may be hung. Remember to always hang the union blue stars so they are visible to the observer on the left. 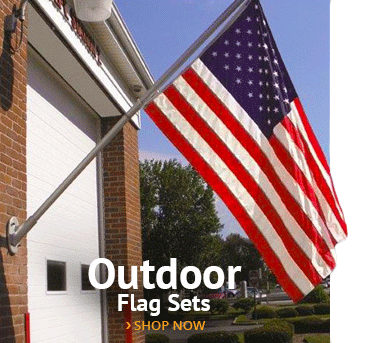 Only place all-weather-type flags outside during harsh conditions, such as rain, sleet, or snow. Illuminate the flag if it will be displayed at night. The union (or stars) should always face the observers’ left, whether hung vertically or horizontally. On a staff projecting from a building, the union should be placed at the end projecting out. If the flag must be flown at half-staff, it should be hoisted to the top both before and after placing it at half-staff. 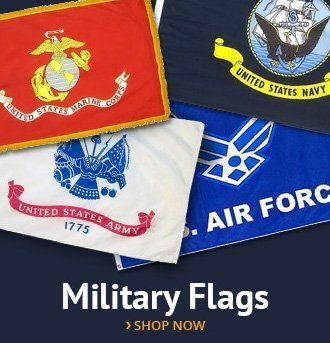 The American flag is truly a timeless decoration, bringing honor and pride to your home or place of business, letting all who pass by or stop in, know you are a proud patriot. 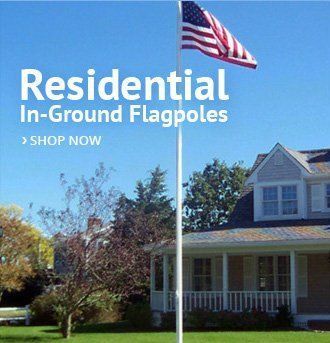 There are so many ways to decorate with the flag that you, by no means, need to settle on the typical front yard pole look. 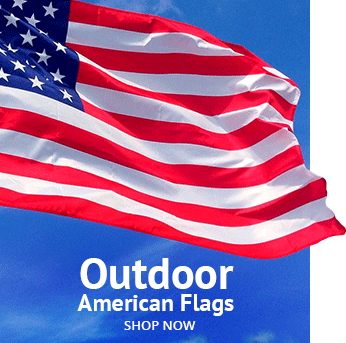 Try out these different styles to respectfully display your American flag. This entry was posted in Flag Etiquette, Honoring Our Veterans, Patriotic Decorating by Administrator. Bookmark the permalink.